Adonis Georgiadis was born on November 6th, 1972, in Athens. He graduated from the Faculty of History & Archaeology of the School of Philosophy of the National & Kapodistrian University of Athens. In 1993, he took over the management of publications ‘GEORGIADIS-LIBRARY OF GREEK’. In 1994, he founded the Liberal Studies Center “GREEK EDUCATION”. 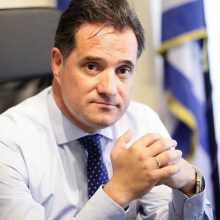 Elected MP in Athens B region in the elections of 2007 and 2009 with the LAOS political party. In February 2012, he joined the Nea Demokratia political party, having resigned from the parliamentary office. Elected with Nea Demokratia in Athens B in the national elections of 2012 and 2015. He was Vice Minister of Shipping in the Government of Lucas Papademos and Minister of Health in the Government of Antonis Samaras. On January 18th, 2016, he was appointed one of the two Vice-Presidents of the Nea Demokratia by decision of Kyriakos Mitsotakis, the President of Nea Demokratia. He is married to Eugenia Manolidou and they have two children, Perseus and Alcaeus.